I started with a chain of 36 stitches and a US H / 5mm hook for a washcloth of about 10" / 25 cm. Any even number of stitches to start will work just fine. Row 1: Chain 36. Skip the first chain and sc across (35 stitches). Chain 1, turn. Row 2: (sc, tr) across, ending with sc. Chain 1, turn. Row 3: sc across. Chain 1, turn. Row 4: (tr, sc) across, ending with tr. Chain 1, turn. Row 5: sc across. Chain 1, turn. Repeat Rows 2 through 5 until the cloth is the size you like. Optional hanging loop: When you reach the end of your final row, chain 15 off the corner, then sc back down the chain. Fold to create the loop and sl st to attach the end to the corner of the cloth. 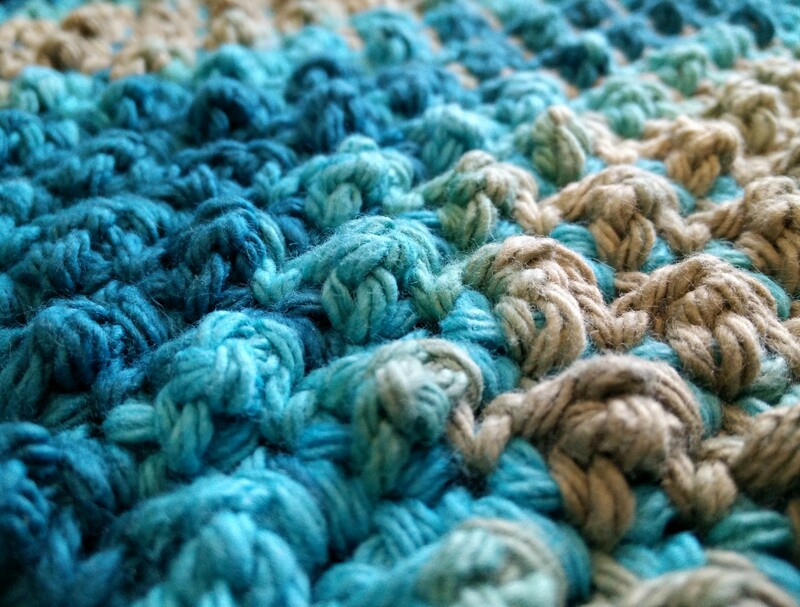 If you prefer a border on your washcloths, you can sc around the whole cloth, putting three sc into each corner (except for the one with the loop). 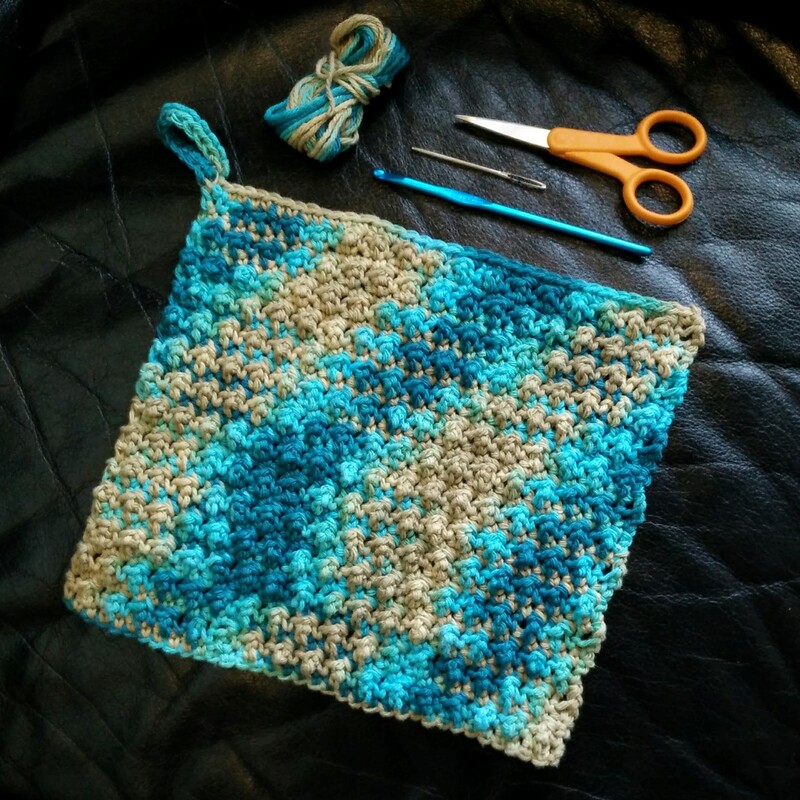 Fasten off yarn, weave in ends, and enjoy your new washcloth! The texture is so neat that I took a giant picture of it. At 3658 x 2774, it could be used for phone/computer wallpaper. Feel free to download it here. The Scrubbing Nubbles Knitting Pattern by Knitting Pirate is licensed under a Creative Commons Attribution-Noncommercial-Share Alike 3.0 United States License. You may not sell or otherwise distribute copies of this pattern, but you may absolutely sell the cloths you make with appropriate credit given for the design. If you have any questions about what you can or can’t do with this pattern, please feel free to contact the Knitting Pirate. If you like the Scrubbing Nubbles Washcloth and you want to leave me a tip, please do!